Being a homeschool parent can be incredibly exhausting and overwhelming, but of course, if you’ve homeschooled your children for any length of time, you probably already knew that. Not only are you their parent, you’re also their teacher and with that comes the responsibility of figuring out what to teach them, how to teach it so that each child learns, and planning and tracking those lessons so that you can keep a record for your state if they require one. It’s impossible to do it all completely by yourself. Fortunately, there are some fantastic homeschool bloggers out there who are not only amazing sources of wisdom when it comes to teaching your children at home, but their blogs are often overflowing with information, lessons, and activities that are already laid out for you! 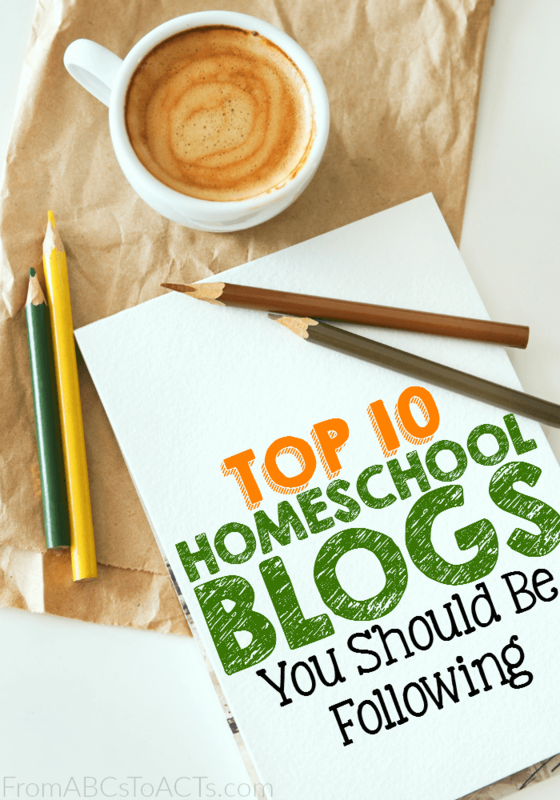 From lapbooks and curriculum recommendations to book lists and free printables, these 10 bloggers cover just about every homeschooling topic you can imagine and should definitely make the top of your “must read” list! Written by a team of contributors, you can always count on finding a ton of great content here. You’ll find posts on field trips (virtual field trips included), curriculum, encouragement, and even a few personal stories from the writers as well. Focusing quite a bit on the younger, preschool and kindergarten, age groups, Beth has put together a fantastic site with tons of free printables that are available for use in your homeschool. She also has a recipe section with some great ideas for those nights when you need something quick and delicious! With tips on saving money in your homeschool, tutorials, hands-on learning ideas and more, Weird Unsocialized Homeschoolers is a fantastic site to visit when looking for a little inspiration. Feeling a little nervous about homeschooling your child when they reach the upper grades? Mary’s site can help! From tips and tricks to make your homeschooling day run a little bit smoother to notebooking and posts filled with incredibly encouraging words, you’ll want to spend days just going through everything her site has to offer. Teaching your young children to read can seem like a daunting task. Fortunately, Becky’s site is just a click away and there you will find numerous ways to help your child as well as a full (and FREE) 31 week reading curriculum! If you find yourself in a bit of a unique situation in your homeschool and are looking for ways to homeschool your special needs or gifted child, Real Life at Home has some fantastic resources. You’ll also find a section full of homeschool organization tips that you’ll wish you’d thought of sooner. If the Montessori philosophy is more your pace, you won’t want to waste any time before you check out Deb’s site. Unit studies, printables, life skill lessons and so much more! You’ll find just about everything you’ll need to implement Montessori learning at home! One thing homeschool parents know is that the day doesn’t end just because the lesson may be over. Your job continues, just in a different capacity. Visit Heather’s site and you’ll find more than just activities and printables to fill your homeschool day! Parenting topics, recipes, marriage posts and more from someone who knows just how you feel. It just wouldn’t be a list of homeschool blogs if Free Homeschool Deals wasn’t included! If you haven’t checked their site out yet, I suggest you head on over right now. The contributors behind FHD work tirelessly to make sure that you have access to the best freebies and deals around the clock and, who doesn’t like to save money?! If you are looking for activities for your littlest students and want to make sure that they’re learning while they’re having fun, check out Heather’s site Growing Hands-On Kids. As an Occupational Therapy Assistant, she has some super simple and fun ideas for working on your child’s fine and gross motor skills, handwriting, and so much more! Being a homeschool parent myself, I know how tiring it can be and how time consuming it is when you’re searching out the resources that will help make up your child’s education. As this site grows and expands to include all age groups, my hope is to make the job of other homeschooling parents, like you, easier so that you can spend your time focusing on what’s really important…your kids!